It is now 11:58 AM ET Time on Wednesday, April 24, 2019. Will you be ready for IM Madness during March of 2019? An ePostal event for swimmers seeking an IM challenge. Choose an event below: Sweet 8, 12, or 24. Start the clock and swim madly. Complete sub-events combining them into a single event. Come back here to the online entry, and submit your times! When: Between Friday, March 1 and Sunday, March 31, 2019 in any 25 yard pool. *Recording Splits: Please have timers record 50 splits for each event. Submission of split sheets may be required for the verification of a record. Click here to find split sheets for your convenience. Fee: $10 for each individual entry. 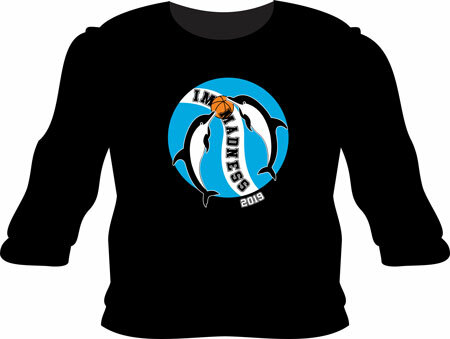 Long sleeved T-shirt: $22 (S, M, L, XL, XXL) Sign up online on Club Assistant, paying with credit card to “Club Assistant.com Events.” Fees are non-refundable. The event must be swum in its specific order in a 25 yard (SCY) pool. The recorded time begins at the start of the 1st swim in an event and ends at the finish of the last swim in the event. Swimmers may rest between events as long as desired, provided Rule 2 is followed. Results are based on cumulative time. Swimmers may swim one or more events. Each event must be swum on a different day. An event fee will be charged for each event. If two or more swimmers report the same cumulative time, a tie will be declared. Per USMS 202.1.1(3). (b) times will not be eligible for USMS records and Top Ten consideration. RECORDS! Click to view the records from 2018. Online Registration closed on 4/6/2019.